So much is made of the famed tracking shot that opens Touch of Evil that it is tempting to think it is remembered because of this incredible opening salvo. Yet, taken on its own the shot is largely a gimmick – three and a half minutes of highly choreographed unbroken movement that ends with a bang. It mustn’t be forgotten that there is still a whole movie that follows this sequence and this brief prologue works primarily to set an ominous tone for the rest of the film. No, this film is remembered not because of a single take, but because of how this take is married to the story that follows; a taut and thrilling suspense that unflinchingly weaves its way through the worst of humanity. Many critics mark Touch of Evil as the closing film of the noir era. Despite it certainly not being the last great noir, this designation is in many ways fitting. The accolade resulted partly due to its 1958 release coinciding with the sunset of the Hayes code, and the film’s bleak sensibility indeed helped kick off a new era of anti-heroes and criminal ambiguity. Indeed, under the Hayes code, by rule good guys won and bad guys faced justice, but Welles here was less concerned with who won and lost than how people act out in desperate situations. In focusing on his characters first despite their places in a convoluted tale of corruption and double-crossing, he produced an affecting masterwork in an oeuvre filled with them. Evil tells the story of Miguel “Mike” Vargas (Heston), a principled Mexican official running a murder investigation parallel to his American counterparts, hardened old-timer Captain Hank Quinlan (Welles) and his longtime partner Pete Menzies (Josh Calleia). With the support of his devoted wife Susie (Janet Leigh), the fresh-faced Vargas is determined to play by the rules while Quinlan is prone to follow hunches and cut corners to bring a conviction. As such, these two figures clash and the resulting collateral damage is shocking and horrific. Welles never allowed himself to be more ugly than in his turn as Quinlan. This figure is an unkempt, clumsy, gluttonous, and vindictive drunk with nary a redeeming quality. Yet, there is a sense that he was once a good intentioned cop that through some fated path disintegrated into his present state. This descent in many ways mirrors Welles own life, a life marked by an initial idealistic ambition later turned sour. But like Quinlan, Welles nevertheless sought to do his job and produce results, utilizing tactics that were rarely orthodox and many times questionable. In always refusing to surrender artistic control until it was wrested from him, he was relegated to find new avenues for his personal projects, many times finding dubious funding sources. By the time Universal gifted him this film, the weariness of operating on his own terms was evident. David Berglund is an ardent film buff and loyal Trylon volunteer. When inspiration strikes, he collaborates with his wife Chelsea to write film reviews at moviematrimony.com and local theater reviews at howwastheshow.com. 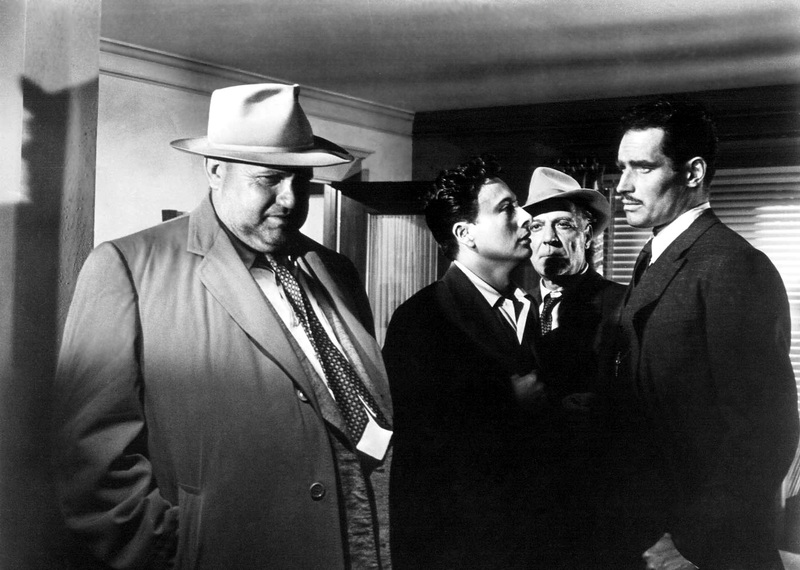 TOUCH OF EVIL screens Friday and Saturday, May 22 and 23 at 7:00 and 9:00, and Sunday, May 24 at 5:00 and 7:00 at the Trylon. Advance tickets are $8.00, and you can purchase them here. From the moment of his film debut, it was clear that Orson Welles had an innate understanding of the power of cinema and a firm grasp of its unique language. His films were never conventional, instead drawing power from visual risks and unmatched innovation. He was as much concerned with film form as any filmmaker, and while his works maintain some thematic continuity (men searching for meaning, familial distrust, corrupted power), it is best to think of him first as an important directorial technician and second as an authorial voice. Perhaps this is why throughout his career, he as an established artistic titan regularly undertook the task of realizing pulp crime stories; these stories were never as interesting as how they were told. The truth is that Welles never wanted to change the world with his art – he simply wanted to enjoy its quirks while he could. This is never more clear than in his “documentary” masterwork F for Fake, which by overtly exploring the ways film can manipulate audiences serves as a perfect marriage of his formal technique and parallel personal contemplations. Ostensibly an exploration of the life of art forger Elmyr de Hory, the film readily comes unhinged from traditional storytelling and moves in a stream of consciousness that slyly prods the sanctity of high art and the importance of truth. With F for Fake, Welles was never more sardonic, nor more candid. There is a clear sense he achieves a sort of personal catharsis in so publicly airing his grievances and thumbing his nose at an establishment he found particularly unwelcoming. It is ironic that in this film, a film demonstrating how film can confuse reality, we find our clearest portrait of Welles as a man. 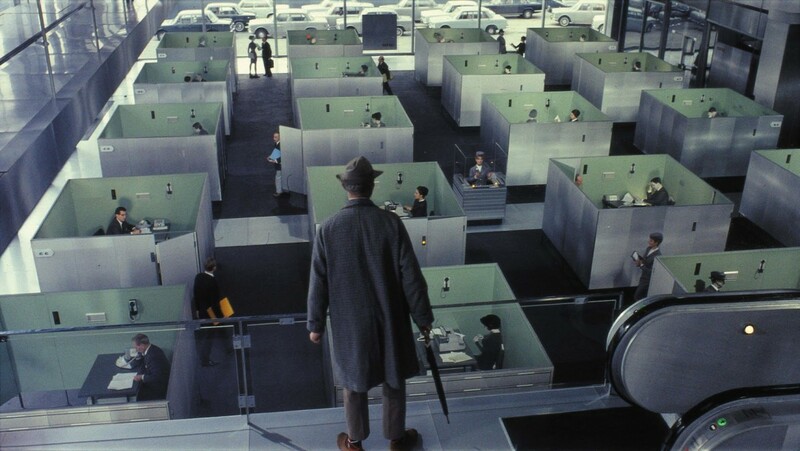 F FOR FAKE screens Monday and Tuesday, May 18 and 19, at 7:00 and 9:00 at the Trylon. Advance tickets are $8.00, and you can purchase them here. 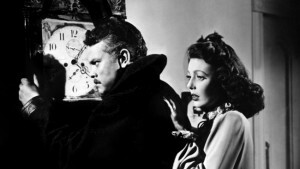 After the spectacular flame-out of his RKO contract, Orson Welles had acquired a reputation — somewhat unfairly, it must be said — as a director whose films ran wildly over budget before tanking at the box office. As if that weren’t bad enough, his unfinished project It’s All True raised further suspicions that he’d “gone bad” as a director — that left to his own devices he’d disappear into the jungle like Colonel Kurtz, taking the studio’s money with him and delivering nothing in return. So it was four years before he got another chance in the director’s chair, and this time he was determined to show Hollywood that he could deliver a profitable film on time and on budget. The movie in question was The Stranger, about an escaped Nazi war criminal named Franz Kindler (Welles) who is hiding in plain sight in a peaceful Connecticut town, posing as history professor Charles Rankin. Nazi hunter Wilson (Edward G. Robinson), who has arrived in town pretending to be an antique dealer, suspects Rankin is the man he seeks, but can’t prove it, and a deadly game of cat-and-mouse ensues. Caught between them is Rankin’s fiancee, Mary Longstreet (Loretta Young), the daughter of a Supreme Court justice. Welles had originally wanted Agnes Moorhead to play the part of Wilson (and what a fascinating movie that would have made) but producer Sam Spiegel insisted on Edward G. Robinson instead. Spiegel also made clear that the film couldn’t go over budget — Welles himself would have to pay for any cost overruns out of his own pocket. THE STRANGER screens Friday and Saturday, May 15 and 16 at 7:00 and 9:15, and Sunday, May 17 at 5:00 and 7:15. Advance tickets are $8.00, and you can purchase them here. When people consider the European phase of Orson Welle’s career, they might think of Othello, or his great, unfinished Don Quixote or even the eccentric, almost unwatchable Viva Italia. But the most representative of his movies from this era was Mr. Arkadin, released in Europe as Confidential Report: it is a baffling, ramshackle affair, and it’s quite brilliant in its own iconoclastic way. Based on several episodes of Welles’ radio series The Lives of Harry Lime, a small-time criminal named Guy Van Stratten (Robert Arden) is hired to investigate the past of a mysterious industrialist named Gregory Arkadin (Orson Welles). Arkadin claims that he can remember nothing before the winter of 1927, and he wants Guy to dig up his life story. Is Arkadin on the level about his motives for the investigation? Does it matter? The assignment seems pleasant enough — Guy is well-paid and travels to exotic locations to interview people about his boss’ forgotten past. But when Guy realizes that each person he interviews about Arkadin winds up dead, he begins to wonder if he’s next. As often happened, Welles had control of this movie wrested from his control during post-production, and as a result there were no fewer than seven versions of this troubled production; it wasn’t until 2006 that a “definitive” version was put together based on Welles’ extensive notes. MR. ARKADIN aka CONFIDENTIAL REPORT screens Monday and Tuesday, May 11 and 12 at 7:00 and 9:00 at the Trylon. Tickets are $8 and you can purchase them here. There is perhaps no greater real-life villain in film history than the shortsighted idiot at RKO who made the decision to destroy Orson Welles’s original cut of The Magnificent Ambersons. Now, to be clear, RKO had a justified business incentive to edit the film to be more marketable, as test screenings did not fare well. In an era when the names of auteurs had far less box office impact, you can’t really blame a struggling film studio for their recut. Yet, considering RKO made massive edits without the input of Welles at all, and that this was possible only due to an absence resulting from his willingness to film his next project for RKO in Brazil for diplomatic reasons, the choice to trash his footage seems pretty vindictive. To this day film buffs dream of what the film could have been, in no short part because the chopped version we are left with is in itself a gem. Every bit as visually daring and emotionally engaging as his previous RKO offering, the much heralded Citizen Kane, Ambersons resonates to this day as a powerful indictment of classism and cultural traditionalism. Despite the film’s somewhat hasty plotting that resulted from cutting 40 minutes off its runtime, it remains a masterpiece. Indeed, it is clear in viewing the film that RKO’s editors neglected to see that Welles’s vision was simply too earnest to be reshaped into something mainstream. No doubt about it, this was Welles working with ample resources at his artistic peak, audience tastes be damned. The film tells the multi-generational story of the old-money, high ego Ambersons and their love-hate relationship with their new-money, progressive neighbors the Morgans. As such, it functions as a sardonic study of the caustic impact of industrial progress on the lives of the American elite, and it is simultaneously funny and austere. Even with the happy resolution tacked on by RKO in post, the film is undeniably bleak. A wartime America looking for hope didn’t like it, but it carried a timely warning – to welcome change and stand up against senseless class barriers to work together. As such, it carries a parallel message to much of the propaganda it shared the cinemas with, but it was comparatively more measured and far less idealistic. In short, it was more human and true. THE MAGNIFICENT AMBERSONS screens Friday and Saturday, May 8 and 9 at 7:00 and 9:00, and Sunday, May 10 at 5:00 and 7:00. Advance tickets are $8.00, and you can purchase them here.